I updated my ktown repository today with KDE 4.14.3 packages for Slackware 14.1. Yes that’s right, 14.1. I had promised in my previous post that I would come up with these packages after Slackware-current had been officially upgraded to KDE 4.14.3 but I was sitting on these packages and thought, what the heck. So here you have them. The set has been spiced up with the latest Long Term Support (LTS) sources that I took from KDE Applications 14.12.3, specifically the newest versions of kde-workspace, kdelibs and kdepim. Essentially, I have used the exact same sources from which I built my KDE 4.14.3 packages for Slackware-current before. Note that there are new packages, upgraded packages and to-be-removed packages here. Some people forget to install the new packages (in particular the new dependencies) and end up with a broken system. As usual, the README file which accompanies this release contains the detailed installation and upgrade instructions. Read these instructions carefully and your upgrade on Slackware 14.1 from either the stock KDE 4.10.5 or my own 4.13.3 will be easy and painless. My previous article on KDE 4.14.3 plus LTS (at that time, targeting slackware-current) contains more information that you might want to read. Posted: 7 April, 2015 in Slackware, Software. You should have added your comment to the Plasma 5 article instead, where it may have relevance. And the answer is: no. You could have checked it yourself by the way, my build sources are public. Why, have you run into this issue? Terrific news, thank you Eric! Thanks for 4.14.3, but i think that amarok must be rebuilded too. it was strange behaviors and is not wornking with GStreamer backend. Great new for Stable! thanks Eric. Diego Aguirre, it’s not amarok, gstreamer produces no sound in it’s present version included. Hi Eric, thanks for your hard work on KDE. I also have no sound on Amarok with gstreamer and your VLC backend. I didin’t tested with the mplayer and xine ones yet. I’m running 14.1. Also, when I check my KDE version it shows 4.14.6 and not 4.14.3 as supposed. Maybe I did something wrong when updating? The version which KDE reports in its “about” boxes is the version of kdelibs. And that package is part of Long Term Support (LTS): it was upgraded to 4.14.6. So while most of KDE is 4.14.3, the kdelibs and kdepim packages are at 4.14.6 and that’s what you see when you check the version of KDE. About your sound issue, I don’t have an answer for you. Some people fixed their sound issue by reverting the phonon-gstreamer package back to Slackware’s own package. reverting the phonon-gstreamer package back to Slackware’s own package solves amarok sound problems. Have better audio quality then vlc backend and replaygain works. Thank you very much for all the hard work you put in. Apart from having Amarok sound problems, kmail is also having problems syncing my yahoo inbox from imap account it stops at 12%, other folders work flawlessly. Its not a yahoo issue, i checked with thunderbird and it syncs perfectly. It syncs Gmail imap works perfectly. and then try to re-sync your mailbox in kmail. Watch for error messages in the Konsole where akonadi was restarted. Great, Eric. Thank you! Even though I use fluxbox, I like some KDE applications, like Okular, K3b and Dolphin. Do you know if KDE 4 will still receice upgrades or will the project advance entirely to Plasma5 ? All the best! As I had no sound with Amarok, initially, I played around with the different backends. Amarok works here with VLC backend only. With GStreamer, just nothing happens. With Xine the progress bar moves, at least, so the music is playing, just without audio output. Finally, with the MPlayer backend, like with GStreamer, not even the progress bar moves. Alex, i just fixed that problem. I reverted to phonon-gstreamer package back to Slackware’s own package and installed gst-plugins-bad, gst-plugins-ugly and gst-ffmpeg. All of them compiled from slackbuilds.org. Amarok is working perfectly now. gauchao, as you can see in my article, KDE is still releasing new versions for KDE 4 components as Long Term Support. Those are ldelibs, kde-workspace and kdepim. I do not know what their schedule is, i.e. until when they are intending to keep releasing LTS tarballs. Aanyone havong trouble with kdeconnect after upgrading? Mine keeps crashing everytime with kdeconnect-kde-0.7.3, I’ll try to downgrade to 0.7.2 and see what happens. What I did was remove kdeconnect-kde-0.7.3 and install kdeconnect-0.8 from SBo, it seems to be working fine so far (fingers crossed). I saw that there’s a package qt-gstreamer1 in ktown, I installed it but haven’t tried recompiling amarok against it. Could tha allow amarok to work with the new phonon-gstreamer? There’s a little issue with kdnssd in the install procedure as it seems it isn’t in the files list neither of 14.1 nor of -current. So, when I tried manually to remove the unnecessary packages of the old 4.10 I got the message kdnssd was not installed. Not a big issue, but you may want to fix it in the installation procedure (if confirmed, of course). I also got Amarok to work again by installing Slackware 14.1’s l/phonon-gstreamer. Not sure if there’s a better solution, but this one works. My belated thanks for making KDE 4.14 available for Slackware 14.1. I’ve just upgraded from KDE 4.13. As suggested by Matt, I kept the stock phonon-gstreamer package to make sure Amarok works (and it works!!). That file which gives a linker error, “/usr/lib64/kde4/kipiplugin_acquireimages.so” is not part of my own KDE packages. Check /var/log/packages to see what package has installed this file. My guess is: digikam. You will have to recompile that package. Thanks for you reply! I re-installed digikam, and now I don’t get those plugin errors in gwenview. I can’t seem to import images through gwenview or the kio camera:/ protocol (no images show up). I can see the images on the camera in digikam, so I have a work-around, but it’d be nice to get gwenview-importer working if anyone knows what that issue might be. … no comments… I try to keep specific computer as close to the standard 14.1 as possible, besides installing all updates. Even reinstallation of *xcb* from x/ did not help. No, I removed the qt directory because on June 11th, there was a security update to Slackware 14.1 which gave us a properly patched Qt 4.8.7 (this same version including the required patches also landed in slackare-current). 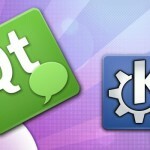 From that moment on, I no longer needed to carry my own patched version of the qt package.